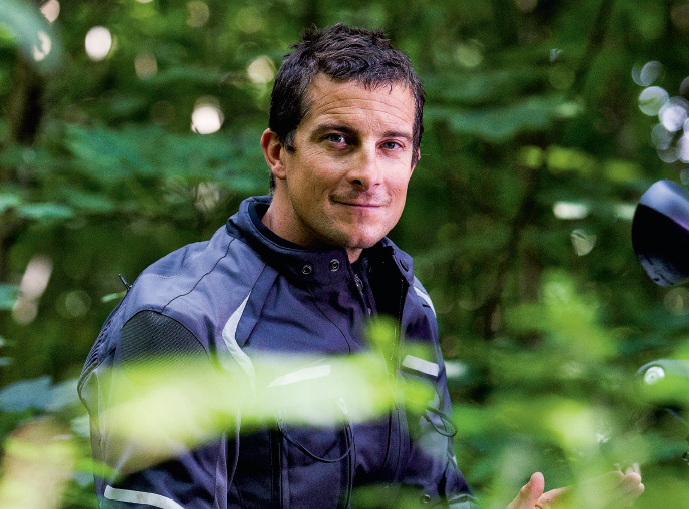 Bike Magazine - "Adventure is Whatever Makes You Feel Alive"
"Adventure is Whatever Makes You Feel Alive"
Bear Grylls is leaning against a dry-stone wall munching an apple, England’s green, rolling fields stretching to the horizon before him. The beautiful setting might not hold the adrenalin charge of Death Valley, the jungle or the Australian Outback, but that matters little to one of Britain’s best known adventurers. “The other day, I jumped on my Tiger to pick up one of the kids. The sun was shining, I had a favourite tune playing and it was one of those moments where you just feel so grateful to be alive. That in itself is what adventure is about for me – doing things that make you feel alive – in the best sense of the word,” he said, relaxing briefly during filming for Triumph’s No Ordinary Adventure Bike campaign. The father-of-three’s self-awareness and dedication to his family ensure he gets the most out of life’s smaller joys despite his stardom. “I’m just an ordinary guy who likes to get out on his bike. Yes, my job puts me in a few extreme situations, but we can all find great adventures in our lives. 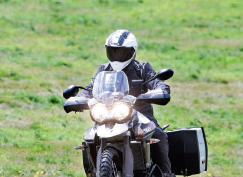 Bear – his real name is Edward, which became Teddy and then Bear – didn’t hesitate when the opportunity arose to work with Triumph and ride the new Tiger XC. “I love Triumph’s heritage and Englishness, and that’s why it’s always my Tiger or Trophy that I go to first. The Tiger is built for adventure but it’s versatile too, whereas for longer road journeys the Trophy is in a class of its own. The former SAS man’s love affair with bikes began as a 16-year-old with a 50cc moped, but he quickly progressed to a 125 and then a 1200cc as a reward to himself for passing selection to the British military elite. One of his first TV programmes was 1994’s Ridge Riders, a documentary about a group of riders who toured England’s historic sites by bike. “When I’m out filming with the crew and we use all these different all-terrain vehicles and bikes to access places, I’m always first to go for the bikes, riding ahead to scout the route. It is always my favourite time, off camera, alone and pushing into new terrain and new adventures, with great friends beside me.